Figure 1: After your Action gets access to the user's Google profile, you can use it to find a match for the user in your authentication system. First, ask the user to give consent to access their Google profile. Use the information in their profile to identify the user. If you can't find a match for the Google user in your authentication system, the flow proceeds depending on whether you configured your Actions project in the Actions console to allow user account creation via voice or only on your website. Figure 2: If you allow account creation via voice and can't find a match for the Google profile in your authentication system, you need to validate the ID token received from Google. You can then create a user based on the profile information contained in the ID token. If you don't allow user account creation via voice, the user is transferred to a browser where they can load your authorization page and complete the flow. Sign in to your authentication system with a different account if they have an existing non-Google account. Allowing account creation via voice is recommended if you want to minimize the friction of the account creation flow. The user only needs to leave the voice flow if they want to sign in using an existing non-Google account. If you disallowed user account creation via voice, the Assistant opens the URL to the web site that you provided for user authentication. If the interaction is happening on a device that doesn't have a screen, the Assistant directs the user to a phone to continue the account linking flow. You do not want to allow users that have non-Google accounts to create a new user account and want them to link to their existing user accounts in your authentication system instead. For example, if you offer a loyalty program, you might want to make sure that the user doesn't lose the points accrued on their existing account. You need to have full control of the account creation flow. For example, you could disallow creation if you need to show your terms of service to the user during account creation. Note: Select one of the flow options below to learn more about implementing the selected flow. If needed, the content of the guide will be reloaded to adapt to your choice. Accounts are linked with industry standard OAuth 2.0 flows. Actions on Google supports the implicit and authorization code flows. 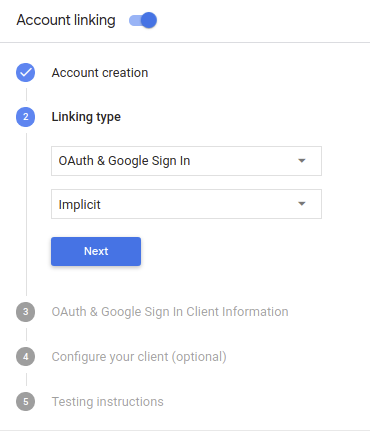 In Linking type, select OAuth & Google Sign In and Implicit. After the user gives your Action consent to access their Google profile, Google sends a request that contains a signed assertion of the Google user's identity. The assertion contains information that includes the user's Google Account ID, name, and email address. The token exchange endpoint configured for your project handles that request. If the corresponding Google account is already present in your authentication system, your token exchange endpoint returns a token for the user. If the Google account doesn't match an existing user, your token exchange endpoint returns a user_not_found error. grant_type The type of token being exchanged. For these requests, this parameter has the value urn:ietf:params:oauth:grant-type:jwt-bearer. intent For these requests, the value of this parameter is `get`. assertion A JSON Web Token (JWT) that provides a signed assertion of the Google user's identity. The JWT contains information that includes the user's Google Account ID, name, and email address. consent_code Optional: When present, a one-time code that indicates that the user has granted consent for your Action to access the specified scopes. scope Optional: Any scopes you configured Google to request from users. You can validate and decode the JWT assertion by using a JWT-decoding library for your language. Use Google's public keys (available in JWK or PEM format) to verify the token's signature. In addition to verifying the token's signature, verify that the assertion's issuer (iss field) is https://accounts.google.com and that the audience (aud field) is the client ID assigned to your Action. The Google Account ID, found in the assertion's sub field, is in your user database. The email address in the assertion matches a user in your user database. If either condition is true, the user has already signed up and you can issue an access token. When Google receives the 401 error response with a user_not_found error, Google calls your token exchange endpoint with the value of the intent parameter set to create and sending an ID token that contains the user's profile information with the request. The assertion parameter contains A JSON Web Token (JWT) that provides a signed assertion of the Google user's identity. The JWT contains information that includes the user's Google Account ID, name, and email address, which you can use to create a new account on your service. If neither condition is true, create a new user account using the information provided in the JWT. New accounts do not typically have a password set. It is recommended that you add Google Sign In to other platforms to enable users to log in via Google across the surfaces of your application. Alternatively, you can email the user a link that starts your password recovery flow to allow the user to set a password for signing in on other platforms. If the Assistant request contains an access token, check first that the access token is valid and not expired and then retrieve from your user account database the user account associated with the token.